A beautiful blending of violet and orris root with silky-soft musk, powdery myrrh and oakmoss topped by sweet touches of wildflower honey and powdered sugar. While society saw a great deal of socio-political progression in the 1890s, and that change in attitude eventually found its’ way into such things as fashion, at the beginning of the decade women’s wardrobes were still exceedingly old-fashioned and restrictive. But some of the loveliest, most feminine scents can be found in that era, and we have created our own version of a Belle Epoque-style “glove scent,” one of the most common uses of perfume at the time. VIOLET ~ Love, faithfulness, modesty; calming, balancing, healing, protection, draws luck & fortune, lust. ORRIS ROOT ~ Attracts and helps inspire love. Protection, divination. WILDFLOWER HONEY ~ Enticing, seductive; use to bewitch a straying or hesitant lover. Happiness, fulfillment. MOSSES ~ Luck enhancing, financial success, protection, charity. Parental love. Humans experience life, love and time for a limited span and every experience is precious. Each year offers us the chance to renew our spirit and resolve to make the best of every moment. 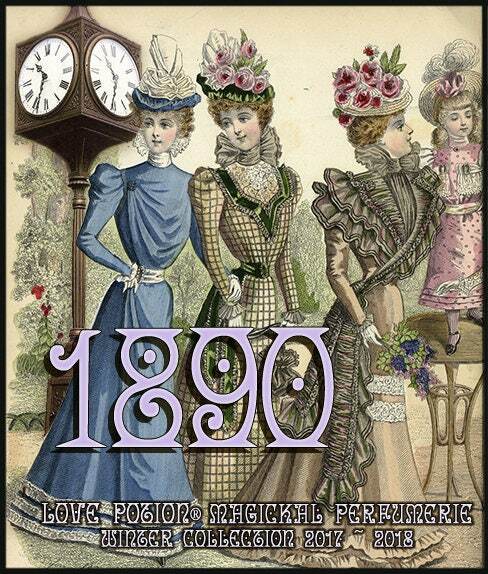 This Winter, LPMP invites you upon an olfactory journey throughout history, because you don’t need the devices of science fiction to time-travel...all you need is perfume. Scent is the most evocative of all the senses and the fragrances in this collection are truly Time in a bottle, one whiff of each of our temporal-themed scents will place you in the exact moment we have created so that you may experience the magic of when imagination meets artistry.